maybe it was the magic of Christmas that was a childhood gift from my parents, but whatever it is, it has stayed with me my whole life. I can’t help myself – I feel more love for each other abounds around Christmas. I don’t care if it’s just a fantasy of mine – I feel it and it certainly has an impact on how I relook at life – mine, yours and even strangers I haven’t yet met. 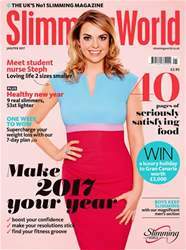 Often our members are those strangers I have yet to meet and I know they are so firmly in the minds of everyone at Slimming World as we prepare to hurtle into another exciting year.